I have been asked many times to draw a bigger version of the Didi 26, one with a bit more headroom, that is more suitable to be used as a small performance cruiser for coastal cruising. We now have the Didi 28 Maxi Trailer Sailer to do just that, a cruiser/racer that you can build for yourself from plans. It expands our range of radius chine plywood designs that started with the DIDI 38, which I designed and built for myself in 1994/95 and which was followed by the DIDI 34, Didi MG30, Didi 26, Didi 23 and our two boats to the Mini 650 Rule, the Didi Mini Mk2 and the Didi Mini Mk3. The Didi 28 is a direct development of the Didi 26, so it has many of the same features. It is in every way a big sister to the 26 but with more space built into it for comfort. This was achieved with a small increase in length and proportionately greater increases in beam and depth, as well as by raising the cabin structure to gain more headroom. This design is about 380mm (15") wider than legal towing width for most countries, so we are calling it a "Maxi trailer-sailer". It will need a special permit to tow it legally but that will allow you to take it home for winter storage or to tow it across country to new cruising waters that are not accessible by other means. Construction is mostly from 10mm plywood, which is used for flat areas of the hull and all bulkheads, assembled with a 12mm plywood self-jigging backbone and solid timber stringers. The radiused portion of the hull skin is two layers of 5mm plywood bonded together in place. Keel loads are carried by bulkheads and the structure of the keel box. All of these parts are plywood and epoxy filleted together, making for simplified construction. 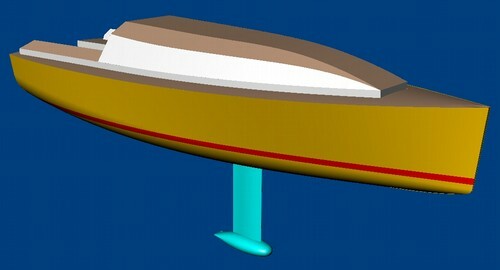 Assembly of the hull follows the principles of model aeroplane construction, with stringers slotted into the bulkheads for attachment of the skin. Deck construction is done in a similar way, all in single skin 10mm plywood. The cabintop is designed with a multi-chine skin and is assembled over the bulkheads by the stitch and glue method for a strong and lightweight structure. Suggested plywood for construction is okoume (gaboon) ply throughout. Epoxy coated and painted inside and out to hull and deck, a good standard of finish is achievable with little or no fairing aside from forming fillets at internal angles. The addition of a layer of glass fabric to the outside will give increased resistance to knocks but will add weight and require fairing, thereby adding a fair amount to construction time and cost. 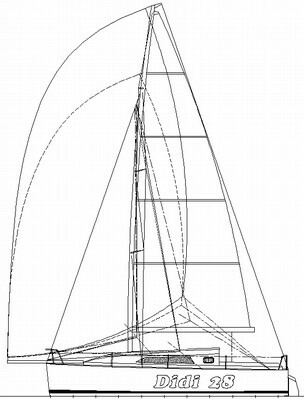 The standard keel is a vertical dropkeel with a 550kg (1212lb) bulb on the end of the high aspect foil. It is lifted by a tackle system led to a cabintop winch. 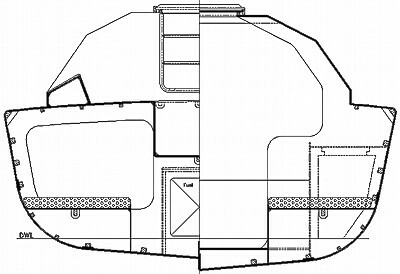 Fully retracted, the bulb remains below the hull, with a draft of 0,575m (1' 11"). Sailing draft is 1.95m (6' 5"). The bulb can be done in either a simple vertical sided foil section for owner casting or a beavertail torpedo shape for professional casting. 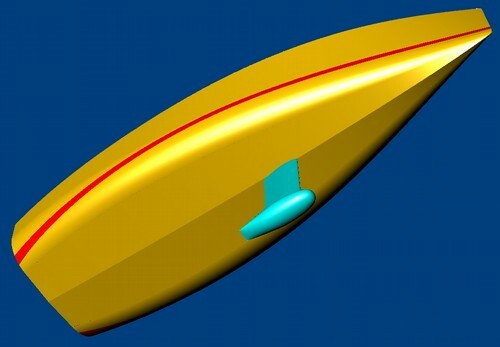 An alternative fixed keel option will be added to the drawings soon. The rudder has a fixed blade and is transom hung on conventional pintles. The rig is deck stepped and is fractional with two sets of swept spreaders and jumpers to support the topmast. This makes her easy to handle with a small crew whether racing or cruising. Shrouds go to outboard chainplates to minimise rig loadings. The working headsails are non-overlapping and sheet inside the shrouds and a 150% Genoa sheets outside the shrouds. Masthead and fractional asymmetrical spinnakers and a light drifter/reacher sheet to the spinnaker blocks on the quarters. Options of cruising oriented headsails flown on furlers or racing oriented headsails flown on hanks or headstay foil are both shown on the drawings. The spinnakers are set on a retractable pole on the foredeck. 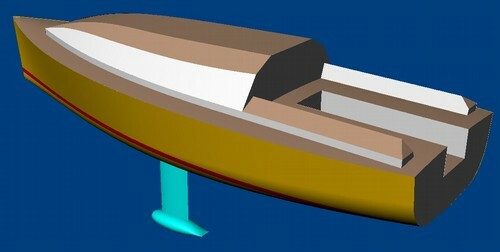 The inboard end is fitted on a radiused transverse track to allow the outboard end to be projected up to weather for sailing at deeper angles. Extension and retraction of the pole can be done from either rail, with the pole retracting to whichever side is convenient at the time. Down below she has comfortable accommodation, to sleep four in two cabins. The dropkeel casing interupts the interior, so we used it as one side of the enclosed heads, which includes a bin type wet locker and basin. The dinette is in the forecabin, with a table that drops to convert the pair of single V-berths into a double. Aft are two quarter berths with the saildrive inboard diesel motor between them. Other layouts will also be possible. I will draw a more conventional cruiser layout when time allows. 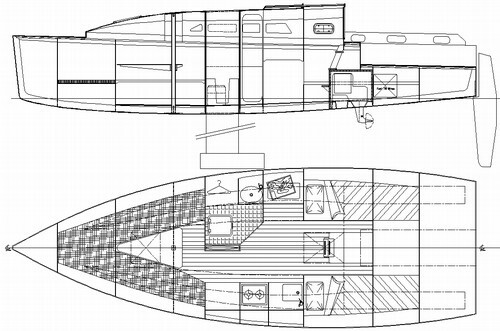 On deck, she has a conservative cruising-type trench cockpit with open transom and coamings with storage compartments. She has oversize cabintop winches to help handle the loads of raising and lowering the dropkeel. Included in the stock plan package are full size patterns of the backbone and various other components, plotted onto mylar film on our large format inkjet roll plotter. Bulkhead shapes are simple and easily set out from clear diagrams, the setting out taking about 3 to 4 hours per bulkhead. For those who would prefer to have full size patterns for the bulkheads, we can also supply them as an optional extra. Choose the building option to suit your own needs. Whichever route you choose, we will be available to assist with advice if any problems arise. Follow these links to an article on radius chine plywood and other designs of similar construction, the Didi Mini, DIDI 23, DIDI 26, Didi MG30, DIDI 34 and DIDI 38. We also have an amateur projects section where you can see other projects to our plywood and other designs. Click here to view the list of drawings or material list for this design.